The DASUTA Sports Fitness Headband is a unique and trendy solution for fitness enthusiasts alike! Perfect for any type of Health and Fitness Training, the DASUTA Sports Fashion Headband is a simple yet revolutionized design that serves a variety of purposes. Soft and Stretchy : We only use the best and eco-friendly material for our products and just incredibly comfortable. After your games or work out, just hand wash the headband and air dry it.the Fitness Headband stretches easily while maintaining a comfortable fit. It also has the innovative technique to wick away moisture while exercising making it even more comfortable without the worry of chafing or itching your forehead. One size fits all : One headband fits everyone, easy to take care of and clean by washing in cold water.Specific product size see picture. The most common uses for the Fitness Headband are: running, walking; hiking, marathons, yoga and any type of aerobics class like spin, but is not limited to gardening, traveling, shopping or even wearing to work or school. It is truly the newest must have Fashion Headband for any woman, period! 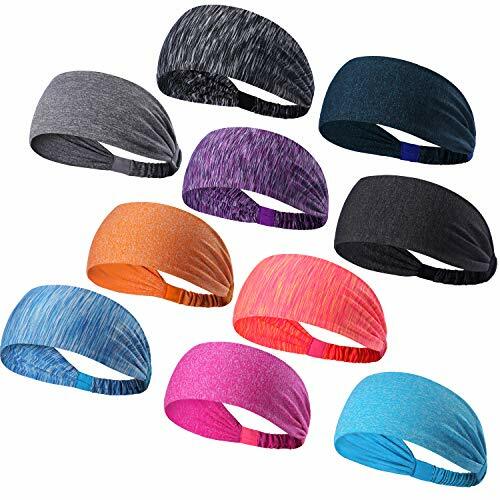 Style and Color : The fitness headband fits both men and women and We have different styles, comes in 5 and 10 different colors.Every day different colors, you can match different clothes! Make your mood more beautiful! Looking for a quality and stylish headband at reasonable price? Worry about the sweat dripping in your eyes or headache for long time use? So, what are you waiting for? As you see we have thought everything out, our holder is just what you need!Order right now and when you do,get a free shipping... one for you and one as a gift for a friend. FASHIONABLE DESIGN! 2017 latest popular elements! what are you waiting for?CLICK THE "ADD TO CART" BUTTON NOW!! It belongs to you now! The best Quality Fabrics: We only use the best and eco-friendly material for our products. The headband is made of 87% Chinlon +13% Lycra spandex, which is super soft, breathable and stretchy. Super soft perfectly absorbs all sweat during sports activities like yoga, running and fitness. Stylish Design: not only keeps your hair out of your face, you can also style the headband to suit your mood, hairstyle and activities. It's fully reversible, so you can flip it over to create your own styles, even use it as a neck warmer or scarf outside of the gym in winter. One Size Fits All with Unisex Design: Thanks to the elastic band closure, it can be easily adjusted to suit your specific needs and ensure maximum comfort at all times. Forget about your old, tight and boring headband that only caused you discomfort in the past. DASUTA colorful and stylish headbands are designed with your max comfort in mind. 10 Colors With Fashion：10 different, vibrant colors ,Pick the one that matches best with your outfit and enhance your style instantly. Great for all hair types and styles.Those remarkable elastic headbands in many beautiful colors that will make your hair look absolutely stunning! Use very widely：Perfect in everyday wearing and all kinds of sports activities like yoga ,soccer,Running,Travel,Working ,Fitness,basketball, baseball, football, tennis and so on! If you have any questions about this product by DASUTA, contact us by completing and submitting the form below. If you are looking for a specif part number, please include it with your message.